Discover a whole suite of new, musical nature connection activities that develop creative thinking, personal musicality, teamwork and quite possibly some harmony with the planet too! This is a not just an actual 'person to person' course - it also includes a full online video based reminder course worth £99! Bring your children for free! Want to know a bit more? Watch the video! Discover and learn to share the harmony, literacy, numeracy and science of Nature through fun music based activities. NO need for musical instruments! Come along and be part of the birth of a new musical movement, a new harmonic vibration! Classroom Teachers and Music Teachers alike. Wow! What a truly inspirational and uplifting weekend! Chris, can't thank you enough - for your generocity of time, information, ideas and kindness ... and once again, thank you everyone for making a safe space for honesty to flourish and the embers of "daring" to burn brighter! The plan is to gather on Friday evening for a 9.30am start on the Saturday morning. We have a lot to cover in a timeless way! Dinner will be made for us using Trill Farm ingredients - all diets catered for. Pls bring your own lunches and breakfasts. We will finish by 4.30 on Sunday afternoon. 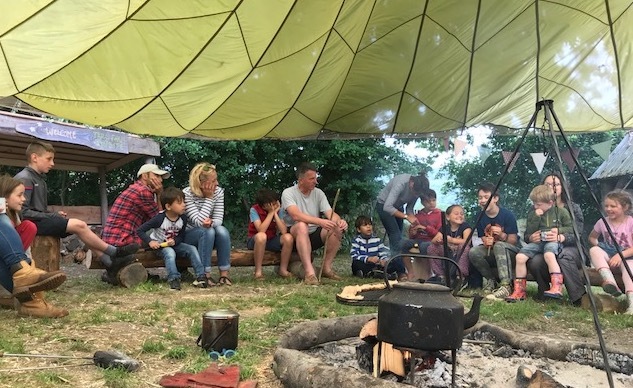 Based at the lovely Trill Farm Campsite we will visit a number of different habitats in the Farm to learn simple and fun ways to encourage musical collaboration, learn about plants. The campsite at Trill Farm. The campsite has a hearth under an old oak tree, two open barns, one with tables and running water, there's also solar showers, compost loos and amazing views of East Devon countryside. I think it's the perfect place to run back to simplicity courses... and you can get there easily by train and bus. If you can't bring your own tent you can hire one from me or sleep in the communal bell tent. Trill Farm is a 300 acre mixed organic farm set in the rolling hills and woodlands of East Devon. Romy Fraser, who started Neal's Yard Remedies bought the farm in 2008 with the aim of developing an education centre and community of small businesses that could work together to use the land's resources.